Thanks to the Grand Secretary of Texas, RW:. 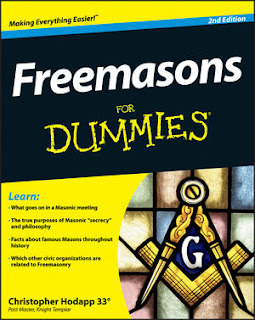 Tommy Guest, for recommending Freemasons For Dummies in his monthly message to lodges. The steps of my path to Freemasonry began in Texas, a debt I can never repay. I just stumbled into Charles Martin's Blog about Freemasonry in Iraq. Brother Charles is working on the creation of Land Sea and Air Lodge No. 1 in Iraq, chartered May 2, 2006 by the Grand Lodge of New York. From the sounds of it, getting this lodge started has been a long, hard job. They started working on getting the charter in November 2005, received it in May of this year, but won't meet until September. I see that they have tee shirts available. Best of luck to Brother Martin and all of our brothers serving the cause of freedom. I found his information while looking at the Military.com Forum about Freemasons in the military. Interesting site. I'll be at the Masonic Home Festival in Franklin, Indiana in the vendors' tent selling and signing books this Sunday August 20th, between 8AM and 3PM. Drop by if you get a chance! My own Knights Templar Commandary, Raper Commandery No. 1 in Indianapolis, has won First Place in the Class B Drill Competition at the 63rd Triennial of the Grand Encampment of Knights Templar in Houston, Texas this past week. Captain George D. Kivett, who has had the distinction of having won six consecutive Triennial Drill Competitions, was recognized as the Outstanding Drill Captain. George IS an outstanding Drill Captain, and his dedication to Freemasonry and Templary is unquestioned. This represents untold hundreds of hours and decades of service, skill and leadership, and he deserves far more than just an award. Congratulations to everyone on the team, and especially to George. I just received word via the Philalethes Society that the mainstream Grand Lodge of Delaware has voted to extend recognition to the Most Worshipful Prince Hall Grand Lodge of Delaware. Meaning that the last dozen or so holdouts remain mainstream GLs south of the Mason Dixon Line. I was in Macon, Georgia this week working at one of my real-world jobs. The day went well and we got finished quicker than expected. I happened to luck into the business meeting of Mabel Lodge No. 255 and I had the honor of meeting the Grand Master of Georgia, MWBro. F. Ray Jackson. I found him to be a gracious and generous gentleman, and enjoyed the lodge's warm hospitality. They serve up a fine pork chop. Many thanks to their Worshipful Master Jammell Corliss, RWBro.Carl Dohn PGM, Grand Marshal Walt Bowers, and all of the other brethren I met this evening. Please forgive me for misspellings and omissions - I knew I should have been taking notes, and they don't have a website I can cheat off of! I also had the pleasure of meeting several Prince Hall brethren who work at the Crowne Plaza Hotel. They went out of their way to help a hot, overweight Brother who had been broiling in the Georgia sun move lots of heavy camera cases, thereby saving me the embarrassment of passing out from heat stroke in the lobby. The hospitality has been outstanding here in Macon, and I wish I could have had more time to explore before heading home in the morning. I have to quit my other jobs - they're interfering with my Freemasonry! BTW, I highly recommend two downtown Macon eateries. Luigi's Italian Restaurant is friendly, fun and has excellent food. And the Downtown Grill is absolutely outstanding. They put up with a group of ten of us, and the food and service was way above average. Sarah and Heather were great fun, knowledgeable and incredibly efficient with a large party. They deserve a raise. I recommend the mixed grill (filet mignon, lamb chop and quail), and order just one of the vanilla/cinnamon ice cream amaretto cakes for an entire table. It is as large as an average human head. The perfect kit for anyone who wants to know more about the secrets of the Holy Grail! Long before “Monty Python and the Holy Grail,” the Grail Quest captured the imagination of writers and the public. Long believed to be an actual goblet brought to Spain by Joseph of Arimathea, the Grail inspired Mediaeval knights to go on pilgrimage in ill-fated attempts to find it. More recently, the Grail has gained new adherents as a different kind of treasure, the royal bloodline of the descendants of Jesus and Mary Magdalene, kept secret for two millennia by the Knights Templar and the Masons. Books like The DaVinci Code and Fair Winds’ own Bloodline of the Holy Grail have introduced this Grail concept to millions of people. This kit is for them. This kit contains a 176-page book about the bloodline of Jesus, 22 full-color cards of the people involved, a full-color map and genealogical chart, and a grail medallion, all packaged in a keepsake box. Eric Schmitz is a 12-year Freemason, with a longstanding interest in Arthurian legend and Grail mythology dating back to childhood. He is a Past Master of Monroe Lodge #22 in Bloomington, Indiana, a co-founder of Lodge Vitruvian #767 in Indianapolis, Indiana's premier "European Concept" Lodge, and an original "Knight of the North." 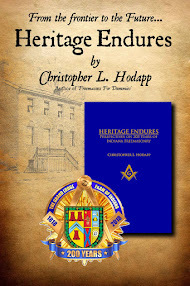 He has written for the Indiana Freemason magazine, and is a co-author of the pamphlet Laudable Pursuit, a commentary on the past, present and future of Freemasonry in America. He holds degrees in electrical engineering and library science. This is his first book. I had the great experience of visiting Wbro. Jason Craig at Valley Lodge in Masontown, Pennsylvania last January. I also had the honor of meeting MWBro. Frank Joseph Haas, Grand Master of West Virginia, and Junior Grand Deacon R. Jay Guminey, also of the GL of West Virginia. That's the greatest thing about Freemasonry - I have met brothers everywhere in the world, and it's like ripples in a pond. Every friendship leads to more and more, and the list just keeps growing. On August 26th, I'll have the honor of speaking at Brother Jay Guminey's lodge, Joseph W. Summers Lodge #173 in Morgantown, WVa. Ulysses Press has officially announced the December release of SOLOMON'S BUILDERS: FREEMASONS, FOUNDING FATHERS AND THE SECRETS OF WASHINGTON D.C.
Solomon's Builders transports the reader back to the birth of a radical new nation and tells how a secretive society influenced and inspired the formation of what would become the most powerful nation on earth. A history that reads like a thriller, it follows George Washington, Benjamin Franklin, and the other Founding Fathers who transformed the lessons of their Masonic lodge rooms into models for a new democracy. In the process, it pieces together the still-visible clues of the Freemasons as it uncovers the mystical Masonic symbolism hidden in the design of the city and in its monuments, statues and buildings. From "all-seeing eyes," pentagrams, and Egyptian-inspired obelisks to the imposing and mysterious Masonic temples of the "Widow's Sons," Solomon's Builders guides readers on a Freemason’s tour of Washington, D.C. as it separates fact from myth and reveals the background of the sequel to The Da Vinci Code.